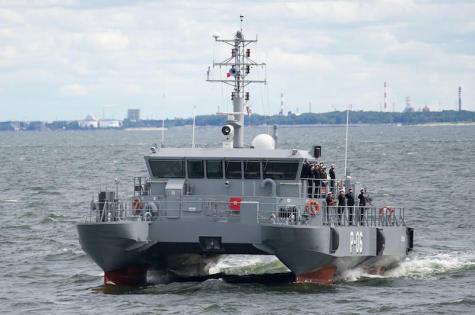 The system was designed for various maritime vessels and is already in operational use by the Latvian Navy as well as other navies worldwide. The iSea-30HD features a unique, cutting-edge stabilization system that enables a stable, continuous and uninterrupted line-of-sight (LOS) - ensuring a very clear picture- even in the roughest of seas. This robust system withstands the harshest environmental conditions including fog, salinity, and moisture. Offering a full solution for naval maritime operations, the iSea-30HD easily interfaces with other onboard systems, including the vessel's radar system providing slew-to-cue functionality. The system comprises the payload electronics box, a Control Unit (CU), a display, DVR and UPS. As part of the contract, CONTROP provided the Latvian Navy a complete ILS package, including training, operator and technical manuals and spare parts. “With the iSea-30HD naval surveillance system, CONTROP provides navies facing the challenges of current marine requirements with the full situational awareness capabilities crucially needed for their Search & Rescue missions and for their ongoing security and safety patrol operations”, says CONTROP’s VP Marketing Mr Ra'anan Shelach. “To mention but one of the iSea-30HD’s benefits, is its real time live images that can be transmitted from the scene to the operational center which enables quick and effective decision making even during limited visibility conditions”, he adds. “Another example is the system’s ability to detect small floating objects previously undetectable by the vessel’s radar, hence facilitating safe and easy entrance and exit of ports”. Describing some of the iSea-30HD system’s features, Mr. Shelach says that this low weight, gyro-stabilized system provides maximum-range surveillance. The system’s highly sensitive sensors include a high performance 3-5µ IR detector based Thermal Imaging (TI) camera, with a continuous zoom lens, a high definition color day camera, and an Eye-safe Laser Range Finder (LRF). The system also features advanced image processing and video enhancement algorithms, Automatic Video Tracker (AVT) and an Automatic Gain Control (AGC). CONTROP specializes in the development and production of electro-optical and precision motion control systems for surveillance, defense and homeland security. CONTROP’s main product lines include: high performance stabilized observation payloads; automatic intruder detection systems;thermal imaging cameras with high performance continuous zoom lens and state-of-the-art image enhancement features, and more.